In an attempt to avoid potential clashes with other events in the area, the Albany Equestrian Centre has put together the following list of events proposed for 2019 at the Centre. For 2019, Albany Horseworld has agreed to sponsor Championships Rugs for the highest point scorer in the three events in both the Junior & Open categories. Thank you, Albany Horseworld, for your continued support of these events. 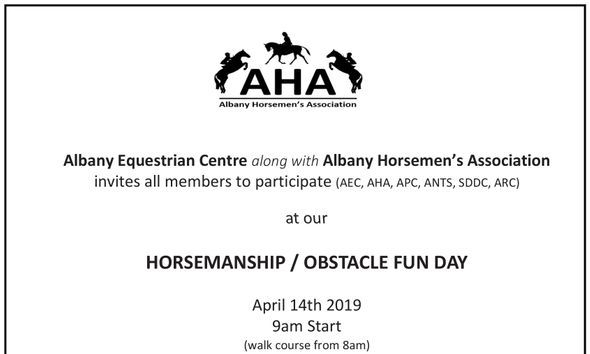 Events conducted by both Albany Horseman’s and the Albany Pony Club are being finalized and will be listed in the very near future. Albany Pony Club Rally: (1st Sunday of the month). ANTs Playday: (the second weekend of the month). ANTs Trailride: (third weekend on the month). Albany Adult Riders Club Rally : (4th Sunday of the month). If you are conducting an event and would like to advertise it on this page, please contact us on the above link.